Friend Betty recently introduced me to a new favorite dining spot of hers, Bellissimo Ristorante in Hillsborough. It’s a couple miles off Route 206, to the West, an area I’m completely unfamiliar with. That’s the amazing thing about New Jersey, go just a little out of your usual way and you’re in a whole new place! The welcome and service were gracious, the food delicious. 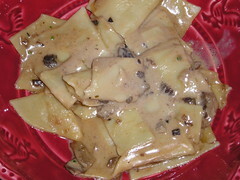 This is their wide semolina noodles (pappardelle) with creamy porcini mushroom sauce. While I enjoyed this as a first course (a half order I couldn’t begin to finish), Betty dove into a huge bowlful of mussels fra diavolo. Then we both had the veal Milanese (Cotoletta di vitello Milanese on the menu) for our main course, and that was delicious too. The large pounded escalope had been breaded and fried, then heaped with well-dressed arugula salad and shaved Parmesan. Delicioso!